Group Visits at The Tolhouse Gaol01493 743930work Group VisitsThe Tolhouse in Great Yarmouth, is pleased to welcome visiting groups and provides a range of group friendly rates/incentives to enhance your visit. The Tolhouse is one of the oldest gaols in the country, dating back to the 12th century. 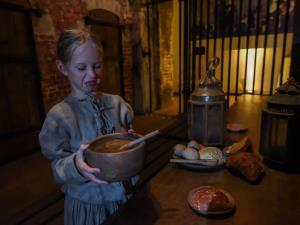 See the original cells and discover the fate of thieves, smugglers, witches, pirates and murderers who were confined here. Use the free audio guide to hear the gaoler and his prisoners describe their experiences. The Tolhouse in Great Yarmouth, is pleased to welcome visiting groups and provides a range of group friendly rates/incentives to enhance your visit. Special rates are available for groups of 10+. Adults £3.45 Concessions £3.25 Group organisers go free. Pre-booking preferred, please telephone Pat O'Grady on 01493 743943.